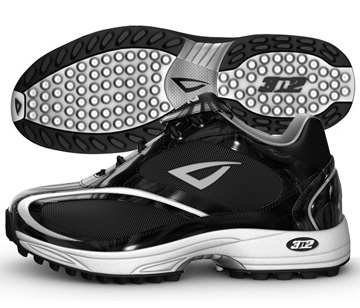 Feather-light Mofo Trainer baseball shoes feature a custom designed, injection-molded LEVIT8 midsole and genuine leather upper reinforced with CORDURA� - "The Tough Stuff" - a revolutionary material that is 3X more durable than polyester, 2X more durable than nylon, and as breathable as conventional mesh. Fitted with a removable leather tongue flap, 3N2 Speed Lacing System and molded heel counter to ensure superior fit and stability. Perhaps the most comfortable softball shoes on planet earth. Black/White Patent Leather.